About two weeks ago, Bioware held another dev livestream, which - as usual - I didn't watch (it started at midnight my time on a weekday, for Christ's sakes), but I appreciated other people staying up to provide people like me with a written summary to read afterwards. (Thanks again, Vulkk! He was extra brave actually, as the starting time in Bulgaria was 2 a.m. I think...) He also has a YouTube mirror of the whole stream though if you really prefer video. Since then I've been thinking about what to write about it, if anything at all. It was super interesting to me, with a lot more details on several bullet points about 5.10 from the autumn road map, but I'm not a news site and there wasn't anything in there that drastically changed my opinion on what was announced previously. Except that they've now conceded that they will nerf story and veteran mode Gods from the Machine when they add master mode, which I consider very much a good thing. I've always liked the three-tiered difficulty structure, I just thought it was ridiculous to crank up the operation's difficulty even more based on where we are right now. The early PTS patch notes also look promising in so far as Bioware seems to be applying the nerfs intelligently, trying to lessen pain points, without using what I came to think of the "Blizzard approach" of simply reducing everything by 20% and calling it a day, no matter what it does to encounter mechanics. It's hard to say much about the guild perks before we've actually seen them in action. My main worry is that they might be seen as mandatory for certain types of content (e.g. if you are a raiding guild, you always need to slot the best perk for raiding at all times), which could end up feeling more like an annoying extra grind than a fun new feature and would also make it harder for new guilds to get off the ground, but we won't know for sure until we see the final product, with correct numbers etc. The biggest thing was of course: the story! You can tell that they are going all out with this one because they made a fancy piece of art which will apparently become our new loading screen come 5.10 - and the only times they've changed our loading screens before was for content drops they actually called expansions (which this isn't). I didn't mind hearing the names of some of the characters involved, but that's about as far as I want to go. Even merely speculating about what exactly might be happening in the story is already almost too much, though this hasn't prevented me from clicking some links and even reading something that might be a massive spoiler and which got me unreasonably excited. As I don't even know whether it's actually true, I'm trying not to think too much about it. Generally speaking, I'm getting a bit hyped despite of myself. I was super excited for the Iokath update bringing back some Republic vs. Empire action, but then the actual implementation of it ended up being kind of "meh". We can hope that they'll do better in this new story, but again: I'm trying not to get my hopes up too much, as that sort of thing all too easily turns into disappointment, and I'd rather be positively surprised than feel let down because I was hoping for too much. I'm very much in "wait and see" mode about this expansion, but I'm rooting for it to be awesome. Well, this isn't even the expansion yet, this is "just" a patch. We still don't even know what 6.0 is going to be about, though I expect they'll tell us soon after 5.10's release. I even started re-reading the Tales of the Jedi comic books recently. Love the "Golden Are of the Sith" miniseries! 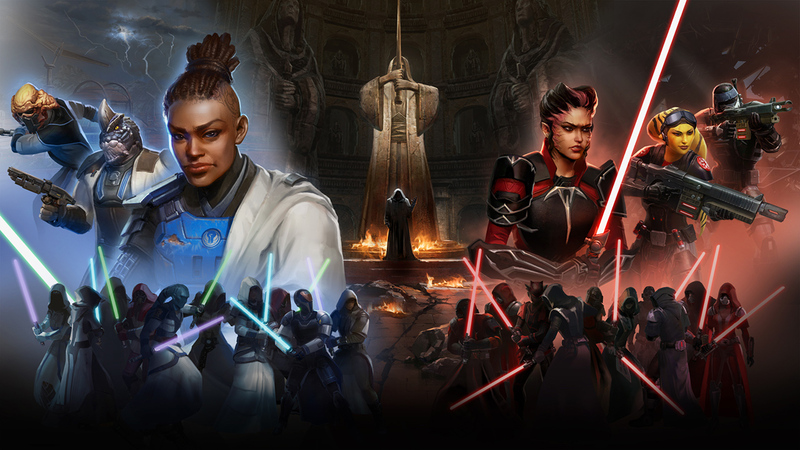 I too am very afraid my own hype may cause disappointment in the end, but I can say at least one thing so far - Ossus Daily is nothing like Iokath's messy metal boredom.